The San Francisco Museum of Modern Art has announced it will present its inaugural Contemporary Vision award to photographer Annie Leibovitz at a dinner on Nov. 3 that will feature a discussion with the artist. The award celebrates "the extraordinary achievements of global leaders -- creators, innovators and change-makers -- whose work foregrounds contemporary art as a vital and meaningful part of public life," SFMOMA said. In addition, the award ceremony supports the museum's education and exhibition programs. "We are thrilled to be honoring Annie Leibovitz, an artist who launched her outstanding career right here in our city, at the San Francisco Art Institute," said SFMOMA director Neal Benezra. "Her bold portraits and documentation of the social landscape help energize critical dialogue about contemporary global leaders, artists and communities. This event will celebrate Leibovitz's important contributions and her powerful use of the photographic medium." Leibovitz began her career as a photojournalist for Rolling Stone in 1970 while she was a student at the San Francisco Art Institute. After her first major assignment shooting a cover story on John Lennon, she became the magazine's chief photographer in 1973. Throughout her work at Rolling Stone and later at Vanity Fair and Vogue, she developed a large and distinguished body of work that encompasses many of the best-known portraits of our time. The award will be presented at the Regency Ballroom in San Francisco. The evening will be chaired by Modern Art Council member Courtney C. Dallaire and will feature a dinner and discussion with Leibovitz. The SFMOMA Contemporary Vision Award is sponsored by Phillips. For tickets or more information call the Modern Art Council at (415) 357-4125 or visit sfmoma.org and see the news release below. SAN FRANCISCO -- On Tuesday, Nov. 3, the San Francisco Museum of Modern Art will honor photographer Annie Leibovitz with the inaugural SFMOMA Contemporary Vision Award. The award celebrates the extraordinary achievements of global leaders -- creators, innovators and change-makers -- whose work foregrounds contemporary art as a vital and meaningful part of public life. Presented by the Modern Art Council, SFMOMA's premier fund-raising auxiliary, this event supports the museum's education and exhibition programs. "We are thrilled to be honoring Annie Leibovitz, an artist who launched her outstanding career right here in our city, at the San Francisco Art Institute," said Neal Benezra, SFMOMA director. "Her bold portraits and documentation of the social landscape help energize critical dialogue about contemporary global leaders, artists and communities. This event will celebrate Leibovitz's important contributions and her powerful use of the photographic medium." 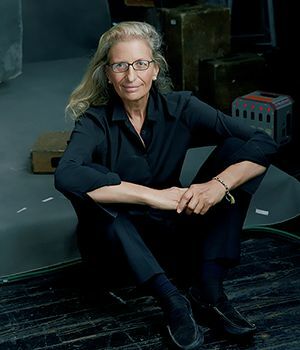 Originally from Connecticut, Leibovitz began her career as a photojournalist for Rolling Stone in 1970 while she was a student at the San Francisco Art Institute. After her first major assignment shooting a cover story on John Lennon, she became the magazine's chief photographer in 1973. Throughout her work at Rolling Stone and later at Vanity Fair and Vogue, she developed a large and distinguished body of work that encompasses many of the best-known portraits of our time. In addition to SFMOMA's Contemporary Vision Award, Leibovitz has been recognized with several other significant honors. She was made a Commandeur in the Ordre des Arts et des Lettres by the French government in 2006, received the International Center of Photography's Lifetime Achievement Award in 2009 and was given the American Society of Magazine Editors' first Creative Excellence Award and the Centenary Medal of the Royal Photographic Society in London. In 2012, she was the recipient of the Los Angeles County Museum of Art Award to Distinguished Women in the Arts, the Wexner Prize from the Wexner Center for the Arts and was honored with the Prince of Asturias Award for Communication and Humanities in 2013. The award celebration will be held at the historic Regency Ballroom in San Francisco. The evening will be chaired by Modern Art Council member Courtney C. Dallaire and will feature a dinner and discussion with Leibovitz in conversation with a notable guest moderator. The SFMOMA Contemporary Vision Award is sponsored by Phillips. The SFMOMA Contemporary Vision Award annually recognizes creative minds across all disciplines and professions who have helped redefine contemporary visual culture. Presented by the Modern Art Council, the award honors the extraordinary contributions of cultural leaders internationally and fosters a greater understanding of their achievements. Proceeds from this annual event help fund the museum's education and exhibition programs, supporting SFMOMA's mission and encouraging the next generation of artists. Tuesday, Nov. 3 from 7 to 10 p.m. Contemporary Vision Award Event Committee: Afsaneh Akhtari, Jennifer Benham, Danielle Berson, Florence Buatois, Candy Caldwell, Ellen Coleman, Christine Curry, Nathalie Delrue-McGuire, Deniece Duscheone, April Filer, Jessica Gaynor, Laura Horn Nagle, Ivette Esserman, Anne Laury, Betsy Linder, Amelia Morris, Sujata Pherwani, Diane Rice, Heather Sawtelle, Claire Slaymaker, Virginia Smith, Christine Suppes, Maria Tenaglia Watson, Marilyn Tortorice, Ariane Trimuschat, Stephanie Tuttle. For tickets or more information call the Modern Art Council at (415) 357-4125 or visit sfmoma.org.